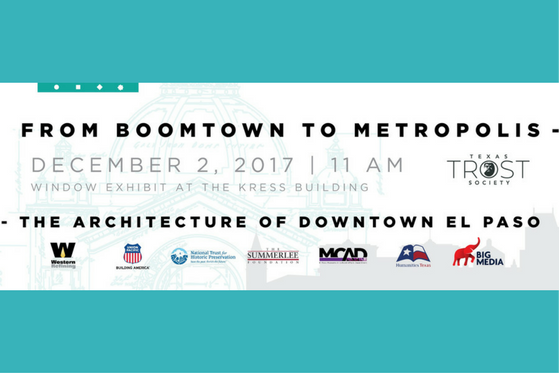 The Texas Trost Society, an organization dedicated to educating the public about the architectural heritage of our region, will host “From Boomtown to Metropolis: The Architecture of Downtown El Paso,” a bilingual exhibition that explores the many different architectural styles that can be found in the city’s historic center. Photographs and illustrated renderings will reveal the details of existing historic buildings, both commercial and residential. This exhibition is the first to be dedicated specifically to El Paso’s architecture, inviting everyone to discover an invaluable architectural legacy. The exhibition is on display in the windows of the historic Kress Building facing San Jacinto Plaza. Join us for the soft opening at 11:00 AM on December 2nd on the Corner of Oregon and Mills, with free tours and giveaways through 2:00 PM!